Hair bows are a cute accessory option that can make any girl - no matter how young - feel like a beauty queen. There are so many options out there, including bow size, bow type, clip type, ribbon finish, and more, there's something available for every girl and every outfit. Before choosing just any bow to put on a baby girl's head, parents should understand the different types of bows available and how they should be worn. Elastic headbands with bows are popular, because it is not necessary for the baby to have enough hair to clip the bow to it. The headbands typically stretch completely around the head and the bow can be positioned centered over the forehead or jauntily off to the side. When positioning a headband, be sure to avoid pressure on the soft spot of the baby's head where delicate tissues can easily be injured. 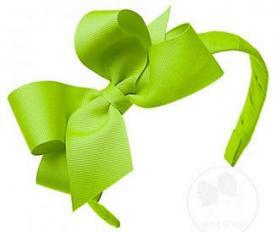 Wee Ones offers headbands with grosgrain bows in a variety of colors. Some styles are available in up to 20 colors. Most are priced at $10 to $15. These bows are sewn onto tiny ponytail holders and are suitable for babies that have enough hair to make small ponytails. Usually this style is not appropriate for infants that have little hair, but they are a great option for babies once their locks start to grow in. Etsy is a great place to look for ponytail bows, as they are generally more difficult to find in traditional stores. The selection is always changing, and you may be able to work with a seller to customize with your favorite colors or to match a specific outfit. Pricing will vary from seller to seller. Picture Perfect Hair Bows has a few different styles of ponytail bows, and the Sassy Circles would look especially cute on baby girls with lots of hair. These cost between $6 and $10. Ribbies has a few styles, most of which feature flowers. There's also a navy and white gingham bow. These bows are under $10. These beautiful bows clip onto the hair with either a plastic or metal clasp, or they can be clipped to headbands or infant hats to vary the look. These are popular and easy to find styles that come in a tremendous range of colors, sizes, and shapes. Some bows are also available with a special non-slip clasp designed to hold securely to even the finest infant hair. 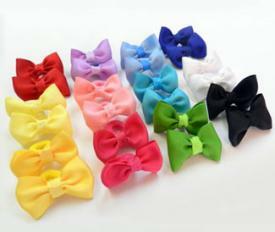 Bows2Cute has a wide selection of bows you can customize. Choose your colors, your clip type, and style. You can even have them embroidered. Expect to pay about $3 to $8. Hair Clippy offers baby and toddler styles that have flowers, creatures (like a cat and an owl), a huge variety of colors and patterns, and more. Prices range from about $3 to $10. 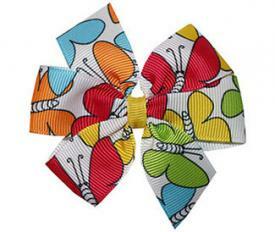 Princess Bowtique has tiny little two-inch flower clips and baby butterfly hair clippies, as well as other styles. These are under $5, but other styles on the site (toddler age and up) are more expensive. When wearing bows, parents need to find the ones that will best suit not only their little girl's personality and appearance, but also her comfort. Clasps should be gentle and soft, without sharp edges or points that may hurt the baby's skin. Headbands should have smooth interior surfaces with no ridge to cause itching, and the elastic should fit snuggly but not tightly around the baby's head. Bows should be placed on the baby girl's head so they will be comfortable, not covering the soft spot or in a position where she could lie on them. Bows should also be placed out of her reach so she does not accidentally pull her hair trying to play with them. Hair bows for baby girls are more than a cute trinket, they are also a stylish accessory that can easily coordinate with even the youngest princess's personality. Enjoy mixing and matching the bows with your baby girl's outfits. With so many color, pattern, and style options, you could have her wear a different bow every day without repeating very often. If you're feeling crafty, you can always make your own, too. It's easier than you might think!